Thank you to all who came out for the 2018 Crossroads Blues Festival and helped make it a huge success! Great music, food, beverages, weather and music fans! Looks like we had the same sized crowd from 2017 of almost 2,800 attend this year and we thank each and every one of you for your support! It was a record setting year for us. Thanks once again! The Ivy Ford Band arrived in Memphis, Tennessee and took the town by storm! They appeared on two nights at the Flying Saucer Bar and Restaurant and huge crowds came to see this fine young musician and her band. She had the folks in attendance eating out of her hand and there was no doubt in anyone attending's minds that this was a band to be reckoned with. ​On the next night at Wet Willies, Ivy had an even bigger crowd there to watch and listen and they were not disappointed. 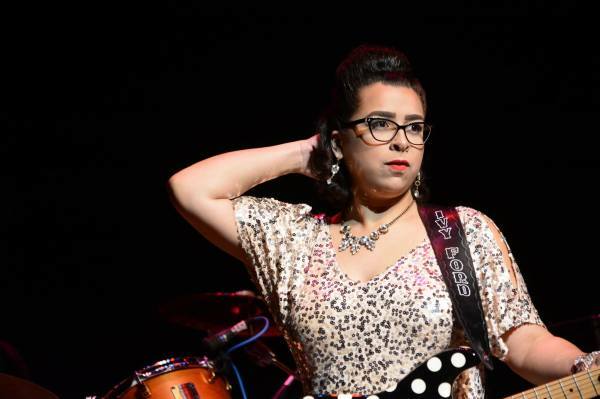 She topped the other seven bands appearing and was selected to appear as one of the final eight bands at the Orpheum Theater on Saturday. The competition was tough and bands with big horn sections and keys seem to fair the best, but as a trio Ivy, Dave and Willie gave it their all. When the winner was annouced they first said a prolonged "Miss" and we think the crowd was expecting them to say "Ivy Ford Band" after "Miss" but alas that was not to be. They have nothing to be ashamed of. They represented themselves and Crossroads Blues Society in an outstanding manner and they made many contacts to further their career as a band. Kudos to them and we wish them the best of luck as they grow in their music and fame! 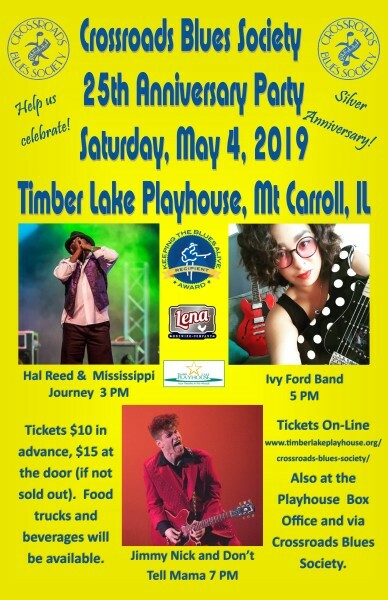 $5 Advanced Tickets to the 2019 Crossroads Blues Festival are available on line here- just clock below. $5/per ticket and a SASE. 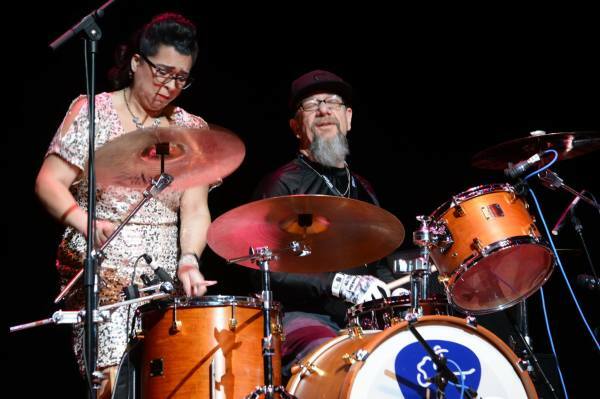 Crossroads Blues Society, or CBS for short, is a 501(c)3 non-profit organization that primarily raises funds in order to host Blues In The Schools Programs in the greater Rockford area of northern Illinois. These programs are fully funded by CBS and there is absolutely no cost to area schools for these programs. We have done this since May 2002 and have done 338 programs for over 68,000 students in northern Illinois since then. Founded in 1994 and incorporated shortly thereafter, we had our biggest year ever in the 2017-2018 School Year with 94 BITS programs fopr over 10,000 students and over 50 shows for the community; hopefully next year will be even bigger! We were the 2014 recipient of the Blues Foundation Keeping the Blues Alive Award for Foundation Affiliates and were also inducted in to the Chicago Blues Hall of Fame in 2014. Funding for BITS now comes primarily through profits from our festival. In 2010, Crossroads embarked on their first festival effort since 1995. The Crossroads Blues Festival, held on the Saturday of the weekend before Labor Day Weekend, was held each of the first four years in downtown Byron, IL. In 2014 it moved and was held at Lyran Park in Rockford, just south of the Rockford Airport. Crossroads has had success each year in providing a great lineup and full day of music at a reasonable cost. The festival features artists on stage and music workshops. 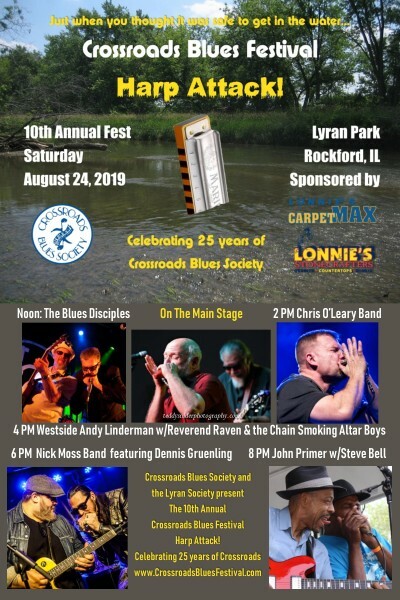 The 9th annual blues festival will be held on August 25, 2018 at Lyran Park. Check out the current and prior festivals at http://www.crossroadsbluesfestival.com/. 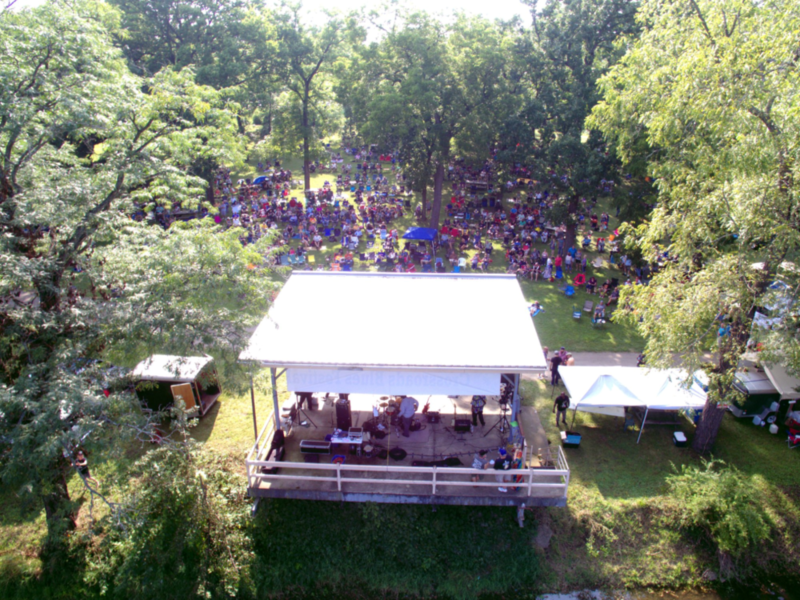 In 2013, Crossroads inaugurated the Field of Blues Festival at Rockford Aviators Stadium. Actually located in Loves Park, the stadium offered a unique venue for blues fans as they could sit on field, in the stands or in one of the covered deck pavilions to enjoy the day. We repeated the event in 2014 and found that while it was a great event we had a difficult time planning and executing two festivals closed together so we will not be repeating this. Go to http://fieldofblues.blogspot.com/ to read about this former event. Crossroads also publishes a bi-monthly newsletter with articles, music reviews and other related information. It is published and distributed to our members, record companies and other blues industry organizations. It is published in full color electronically (usually between 32 to 40 pages) and in black and white as a 12 page hard copy. Each issue usually contains about 30 reviews of recently released CDs, DVDs and books. In October 2013, Crossroads held their first blues challenge and has held one annually since. Crossroads also works with a number of local venues and organizations to produce a number of live music events each year. For the most up to date information, go to our Upcoming Events Page to read about our upcoming events. Our BITS page and other links pages here can give you information and access to our programs and web sites. Joining Crossroads helps us keep the Blues alive and offers you some great benefits. You get our great bimonthly newletter (as described above), you get discounts to admission some shows, and you get first dibs to volunteer to work at our festival (free admission and tee shirt). All the money Crossroads raises goes to our newsletter, some shows and our Blues in the Schools (BITS) programs. Membership more than pays for the newsletter costs and with our shows we try to break even on costs, so the vast majority of the funds we raise go to BITS. We hope that you will join us and help us to support keeping the Blues alive! 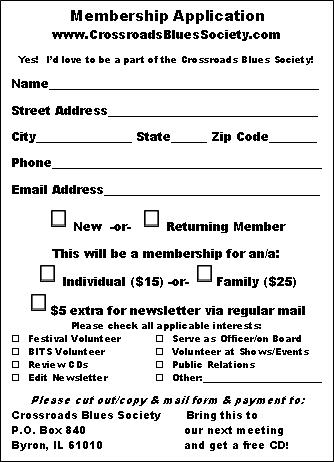 $15 for individuals, $25 for families, and $5 extra for printed and mailed newsletters (larger PDF version is emailed as part of regular dues). New members get a free CD! Join on line or mail you dues in to us! 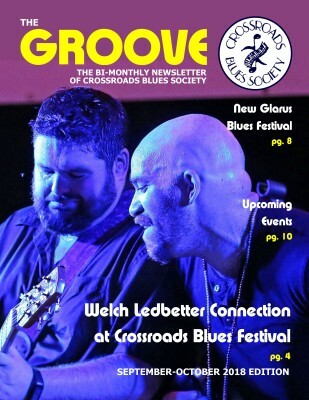 The bi-monthly newsletter of the Crossroads Blues Society. Our issues come out at the beginning of January, March, May, July, September and November. When a new issue goes out to members we archive the last issue on the Issuu website. Click the button below to get to read our last issue of the Groove. They run 32 to 40 pages with 25-30 music reviews, articles and pictures of our events and more!